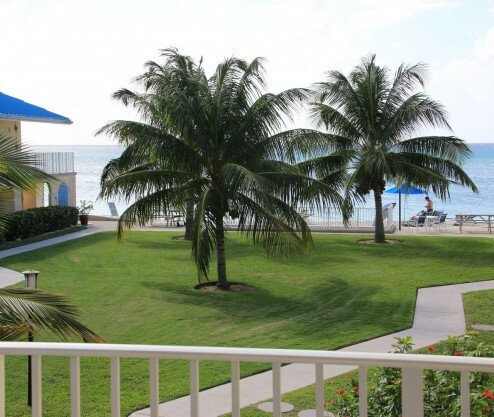 Our beautiful second floor, three bedroom condo overlooks the soft white sands of the best beach on the island, Seven Mile Beach. It is only 60 steps from the Beach. There are beach umbrellas and lounge chairs at the beach available for all guests. Inside a closet on the right side of the complex there are floats and toys for all to use. Inside our unit you will find everything you need to make your stay enjoyable, a complete kitchen, two full bathrooms with glass showers , three Queen size beds, comfortable sofas and a large flat screen TV. It is a fully tiled unit with private parking spot and keyless entry system. Two balconies, one on each floor are accessible from the dining room, living room and two of the bedrooms. Enjoy watching the beautiful sunsets with a drink on your private balconies every night.